PRINCE OF DARKNESS: Down The Quantum-Satanic Rabbit Hole With John Carpenter – Schlockmania! 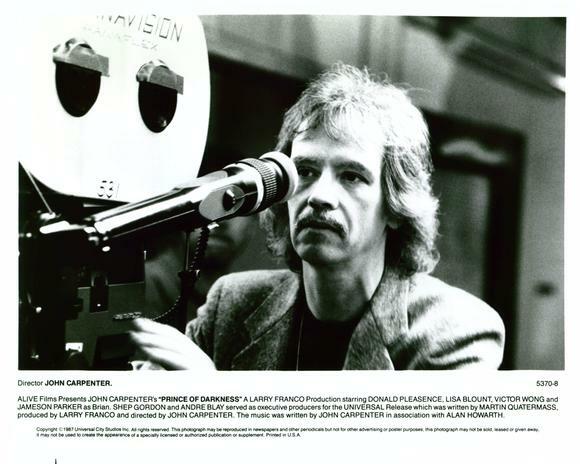 By the time he made Prince Of Darkness, John Carpenter had seen the best and worst of Hollywood filmmaking. He had made it to the major-studio level and made several smart, stylish genre films with A-movie budgets – The Thing, Christine, Starman and Big Trouble In Little China – but none of them provided a breakthrough hit. 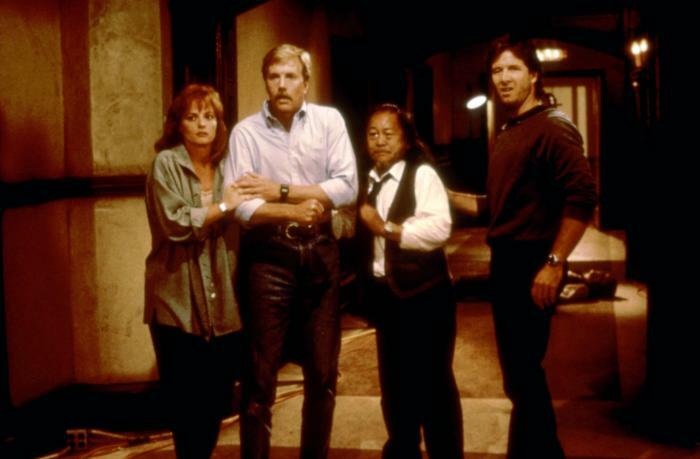 He returned to his low-budget roots, making Prince Of Darkness for around $3 million. It would have been easy, maybe even smart from a career standpoint, to make a simple horror rollercoaster that would turn a quick profit and make him look bankable again. Instead, Carpenter chose to make what is perhaps the most challenging and defiantly quirky film of his career. Prince Of Darkness begins with the death of an old priest who hides a secret. 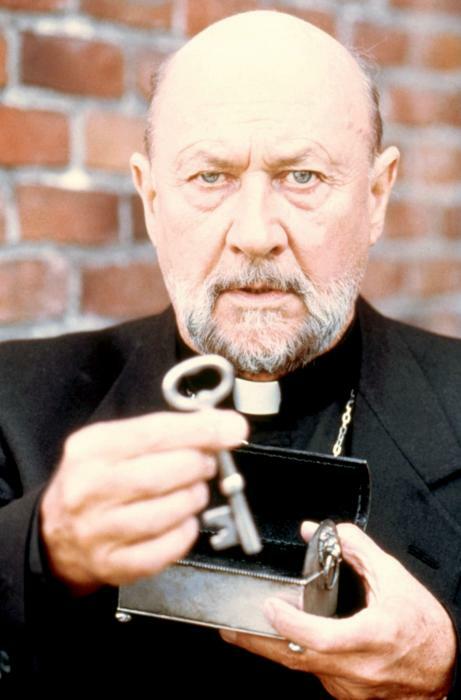 Another priest (Donald Pleasance) is entrusted with that secret – and he enlists the help of quantum physics professor Birack (Victor Wong) in dealing with it. In turn, Birack assembles a team of gifted grad students, including some from other scholastic disciplines, to deal with this secret. Along for the ride are quantum science students Brian (Jameson Parker) and Catherine (Lisa Blount), who have begun a tentative love affair at the outset of the story. The group descends on an inner city church and discovers what might be “the ultimate truth” in its basement – without giving away too many details, it involves the true nature of evil and earth-shattering revelations about what we perceive as God and the afterlife. Unfortunately, as the group begins to analyze the scientific elements of what they have found, the evil awakens and begins to manifest itself in several forms of pestilence – and the heroes have to fight all these manifestations in circumstances that test both their logic and their sanity. If that synopsis sounds a little hard to follow, so is the film – by design. 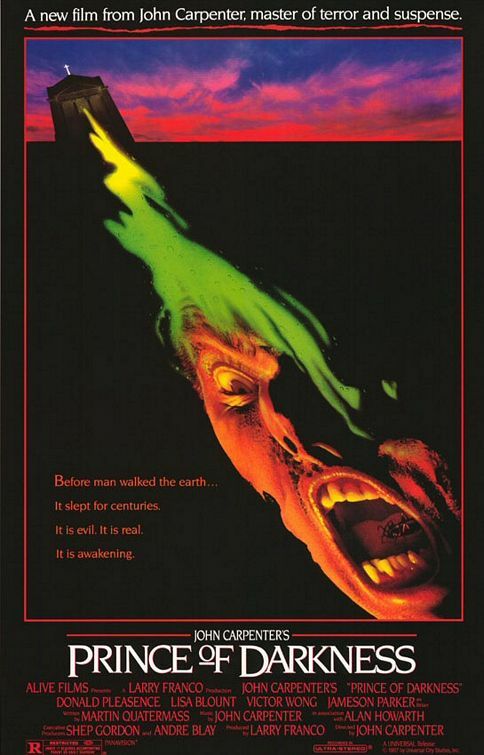 Carpenter uses his low-budget status to indulge in a cerebral, eccentric variation on familiar “Satanic horror” movie conceits, offsetting them with a science fiction-derived skepticism about the supernatural that comes right out of a Quatermass movie (it’s not for nothing that Carpenter uses the pen name “Martin Quatermass” for his screenplay credit here). Carpenter is tough on the audience, withholding key plot elements for the first half of the film and scrambling the viewers’ minds with scientific jargon and theories throughout the film. It’s as if he set out to test the audience. In a lesser filmmaker’s hands, such a challenging script could have made for an unwatchable film. In Carpenter’s hands, Prince Of Darkness succeeds on its own defiant terms as an eerie moodpiece with an intellectual undertow. His sense of craft and economy as a director really helps here, allowing the film’s more outlandish conceits to play well because they are delivered in a clean style with a methodically steady pace. As is often the case with his films, he uses the Cinemascope frame to powerful effect and supports his imagery with an electronic score that is so prominent it practically functions as a character in the film, guiding the audience through the film’s helter-skelter plot with its consistently chilly and creepy atmosphere. Prince Of Darkness is also skillfully acted by a cast of veteran character thesps who play the film’s outré plot straight. Parker and Blount ground the film, creating brainy, likeable characters who the audience can identify with as the plot’s crazy turns pile up around them. Pleasance and Wo ng bring a sense of gravitas to familiar priest and professor roles, with their world-weariness adding dimension to what could have been stock characters. 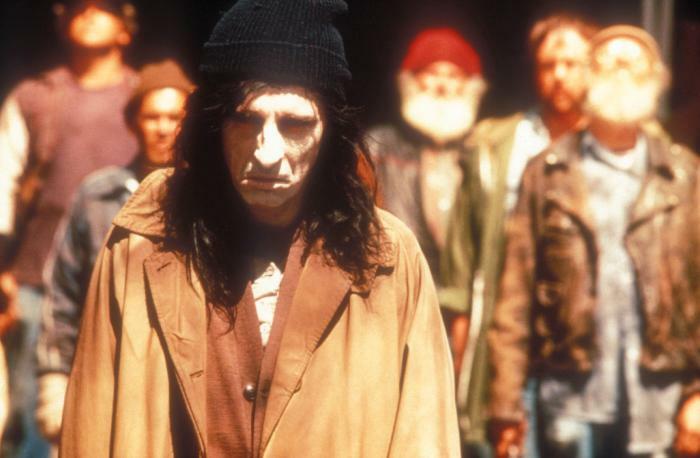 Amongst the supporting cast, scene stealers include Carpenter regular Peter Jason as a charmingly goofy professor, Dennis Dun as the wiseass of the student group (he gets the film’s best one-liners) and Alice Cooper, who is genuinely sinister in a silent role as the defacto leader of the possessed street people. The cinematic results are very dreamlike – there’s even a plot thread involving a nightmare shared by the heroes as the evil unfold around them – and it often connects strongly in surrealistic terms. Carpenter packs the film with unnerving surreal images: ants crawling on the back of a television, a pigeon crucified on a makeshift cross, a homeless woman greeting the priest with a cup full of maggots, etc. There’s at least one suc h image, often more, every reel in the film – and you’ll find them hard to shake off after watching the film. Carpenter uses the film’s offbeat ideas with the same sense of abandon, casually throwing out wild concepts like quantum physics explaining the nature of evil or the idea that video transmissions from the future can be received in the past via dreams. Some critics complain about Carpenter not giving such ideas enough exploration but that’s really besides the point: he uses the bizarre ideas the way he uses the creepy imagery, giving the audience plenty of material to haunt them long after the credits roll. What you do with it is up to you – but chances are the film’s defiant, ghostly style will stick with you no matter what you think of it.